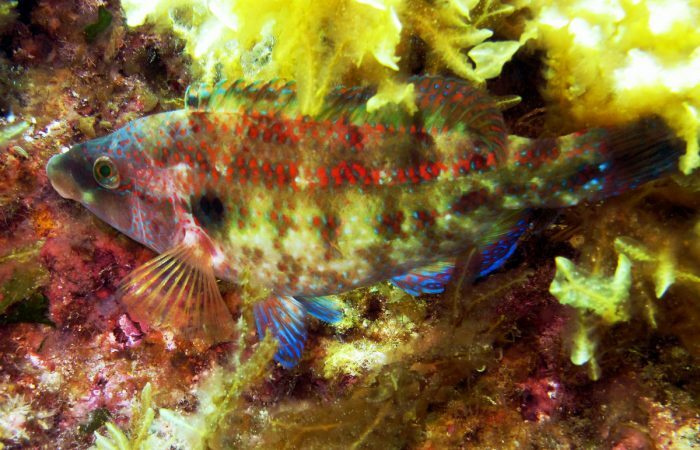 Symphodus tinca, the Peacock Wrasse, is a species of wrasse native to the eastern Atlantic Ocean and along the coastal waters of the Black Sea and the Mediterranean Sea. The genus Symphodus belongs to the family Labridae, suborder Labroidei, order Perciformes, class Actinopterygii, phylum Chordata and kingdom Animalia. The Peacock Wrasse’s body is oval and laterally flattened. Its mouth is rather small, quite protrusive and with rather strong canine-like teeth. There are a few cephalic pores on the snout and the lips have 6 to 9 folds. 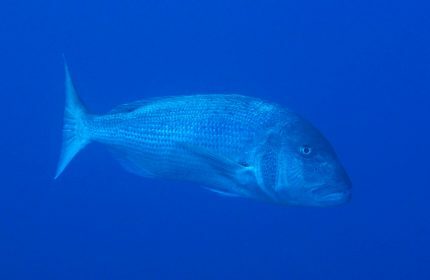 The head of Symphodus tinca is generally longer than its body depth. The dorsal fin is very long and reaches almost to the tail. 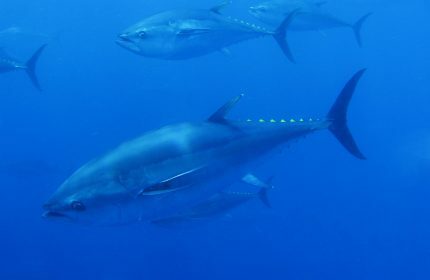 Both sexes have a small dark spot at the base of the caudal fin and a dark blotch just above pectoral fin. Also, many darker spots on the body form 3 or 4 longitudinal stripes. Generally, colour reflects sexual dimorphism. Females and juveniles are grey-greenish or brownish, fading to a silvery colour on the belly. Between immature males and mature females there are almost no differences in colour. Males are more brightly coloured, especially in the breeding season… pale green, green-bluish or green-yellowish, longitudinal rows of red spots, with upper part of head dark blue. This gregarious littoral fish is found on rocky reefs covered by algae, on sea-grass meadows, around rocks surrounded by eelgrass and can also be found in brackish waters in lagoons. It occurs at depths ranging from 1 to 50 metres. This species can reach 44 cm in standard length, though most grow no larger than 25 cm. Peacock Wrasse feeds on sea urchins, ophiuroids, bivalves, shrimps and crabs. Spawning takes place in spring, when a seaweed nest is built and guarded by the male, with one or more females laying their adhesive eggs in it. The photo of this Peacock Wrasse was taken at a depth of 8m at Crocodile Rock, on Gozo’s west coast.